Quarterback Johnny Manziel #2 of the Cleveland Browns was released March 11, 2016, after two turbulent seasons. Johnny Football has been tossed aside. 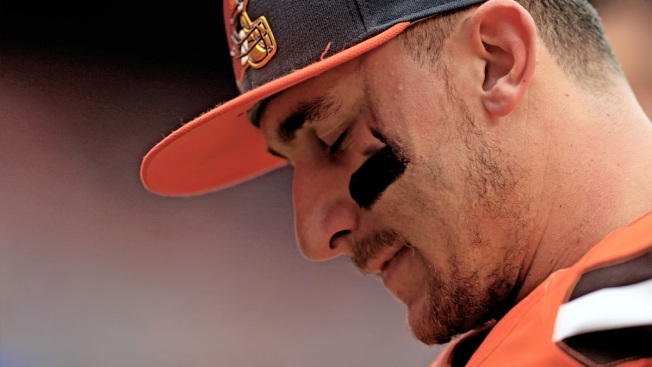 Manziel's unceremonious exit -- the team sent out a brief statement with a few stats and no comment -- ends a drama-filled stay in Cleveland for the 23-year-old, who faces an uncertain future on and off the field. For the first time since he started throwing a football as a kid while growing up in Texas, Manziel isn't a wanted player and he's contending with possible criminal charges for a recent domestic incident in which his ex-girlfriend claimed he struck and threatened to kill her. But he paid for all those late nights in bars and clubs as Manziel hasn't developed the work ethic needed to succeed and he wound up spending more than 10 weeks following his rookie season in a Pennsylvania rehab treatment facility specializing in alcohol and drug abuse. The Browns supported him as long as they could, but his decision to skip the team's season finale against Pittsburgh -- he was injured at the time -- for a trip to Las Vegas and a second domestic incident in three months was more than the team could tolerate and they dumped Manziel, who went 2-6 as a starter. The Browns had been expected to waive Manziel on Wednesday, when free agency opened and the league began its new calendar year. The team, though, waited to see if they could find a team interested in making a trade, that way they wouldn't have to pay Manziel the $2.1 million he's still owed for the next two years.